We all want our kids to be happy, and if there’s one day that should bring them more joy than any other, it’s their birthday. But after no children turned up for this little girl’s fifth birthday party, her heartbroken mother turned to the local community for help. And the result was the best birthday gift a girl could ask for. Lauren Sassmannshausen had everything in place. 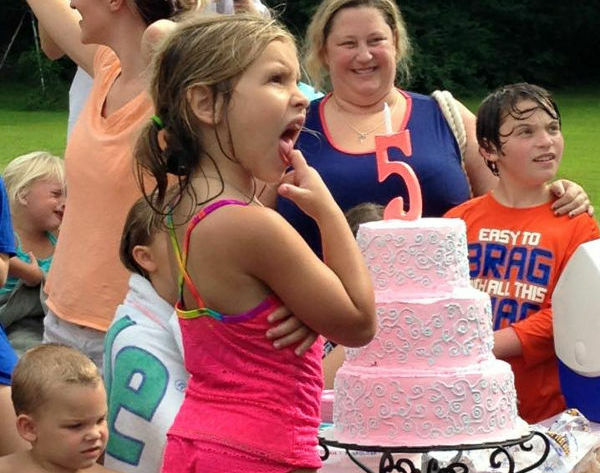 A giant waterslide, lots of party food, and one very excited little girl – her daughter Taliyah, who recently celebrated her fifth birthday. But not one of her friends came. Her mother explains that only a few adults showed, and her daughter was asking after her friends. “My response was ‘they are coming, baby,'” Lauren wrote on Facebook. The call was heeded, with dozens of partygoers proving that the kindness of strangers does still exist. “No one will ever understand the hurt in a parent’s heart when your child looks you in the eyes and asks where all her friends are. I had to hide my tears until I could get away, so she wouldn’t see it. I think what everyone in Spring Hill did was amazing,” says Lauren. She later wrote on Facebook,”Never in my life would I have thought we would have so many people care about a child they didn’t know. I want to thank all of you from the bottom of my heart and I want to express my gratitude to you all for coming out and making my baby girl’s birthday so very special”.